ATLANTA (AP) — Brian McCann slipped on the No. 16 jersey he wore for so many years. “It feels right,” he said, over and over again. Looking to improve on their first division title in five years, the Atlanta Braves agreed to one-year contracts with McCann and former AL MVP Josh Donaldson — a pair of low-risk moves that give the team a chance to make another postseason run while not hindering the long-term development of all those talented young players. Donaldson agreed to a $23 million deal, the Braves confirmed Monday night. The salary matches what the third baseman made during a forgettable 2018 season. 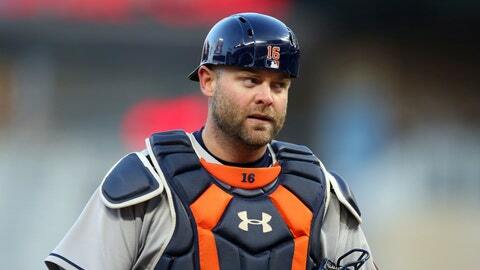 McCann’s $2 million contract reunites the team with a catcher who was a seven-time All-Star from 2005-13. A native of suburban Atlanta, he was eager for a chance to return home with his wife and two children. While McCann’s signing is sure to be popular with the fan base, the acquisition of Donaldson figures to be far more significant to the team’s fortunes in 2019. The Braves are counting on a return to form from the three-time All-Star, who turns 32 next month. It was only three years ago that he captured the MVP award in his first season with Toronto, hitting 41 homers and leading the AL with 123 RBIs. While he followed up with two more 30-plus-homer seasons, a hip injury in 2016 and a strained right calf in 2017 cut into his production. This past season, Donaldson was limited to 52 games by shoulder inflammation and calf issues, hitting .246 with eight homers and 23 RBIs. He was dealt to Cleveland by the Blue Jays on Aug. 31. The short-term deal with the Braves gives Donaldson a chance to show he’s healthy and back to form, potentially setting up a huge payday in the next free-agent market. For Atlanta, it provides another much-needed slugger in the middle of the order to go with Freddie Freeman, especially since it’s not known if the team will make a serious run at bringing back free-agent outfielder Nick Markakis. General manager Alex Anthopoulos attended the news conference for McCann but did not comment on the signing of Donaldson. It was left to McCann to inadvertently mention the Braves’ other acquisition, which the team did not officially announce until hours later. “I don’t even know who that is,” Anthopoulos quipped. Actually, Donaldson and the GM have a relationship that goes back to their days in Toronto. Anthopoulos served in the same post for the Blue Jays until 2015, working out the blockbuster trade brought Donaldson from Oakland. A news conference with Donaldson was scheduled for Tuesday. The Braves designated left-handers Adam McCreery and Ricardo Sanchez for assignment to make room for their new acquisitions on the 40-man roster. Atlanta’s signing of Donaldson raises questions about the future of 24-year-old Johan Camargo, who had a breakout season at third base. He hit .272 with 19 homers and 76 RBIs before going 0 for 15 in a Division Series loss to the Los Angeles Dodgers. Camargo, who has also played shortstop, second base and even one game in left field during his brief big league career, could upgrade Atlanta bench as a super sub — a big priority after the Braves went with a playoff roster that included journeymen Ryan Flaherty and Lane Adams. Or, if there’s an opening in the outfield, Camargo could get a shot to play alongside NL Rookie of the Year Ronald Acuna Jr. and Gold Glover Ender Inciarte. McCann, who turns 35 in February, left the Braves to sign an $85 million, five-year contract with the New York Yankees. After the emergence of Gary Sanchez, McCann was traded to Houston and helped the Astros win their first World Series title in 2017. But McCann dipped badly this year, hitting a career-low .212 with seven homers and 23 RBIs in 63 games. He missed about two months because of arthroscopic surgery on his right knee in July. McCann will share playing time with Tyler Flowers in what the Braves hope will be another effective duo behind the plate, similar to what they had the last two seasons with Flowers and Kurt Suzuki. Suzuki recently signed a two-year deal with NL East rival Washington. McCann thanked Charlie Culberson for agreeing to give up No. 16, which the utility player wore in 2018 for the Braves.